I am so excited to be sharing this year's Christmas Eve Basket with you! I really enjoy putting different themed baskets together, but this one has got to be my favourite to do, as I absolutely love this time of year! If you're doing one of your own, but you're struggling for ideas on what to include, then I hope this post gives you some inspiration! In my opinion, a Christmas Eve Basket makes the day much more fun and exciting and is a lovely tradition to do every year. 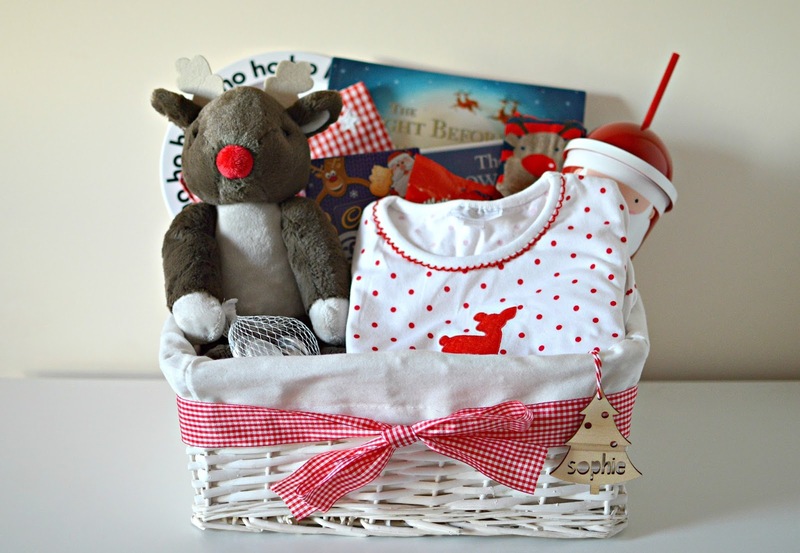 I can't wait to give Sophie her basket on the morning of Christmas Eve, and I'm sure she will love what's inside! I have linked everything below for you too, in case you want to know where anything is from. Every year I include a new pair of pyjamas, and this gorgeous pair from The White Company was actually bought last year in the sale, so I just put them away until now. I like to add a new soft toy too and I just couldn't resist this little reindeer, he is so soft and cuddly! A Christmas Eve Basket isn't complete without a few treats, so I picked up a few chocolate goodies which we can share throughout the day. I've added this envelope so that Sophie can leave her Christmas list for Santa, along with a mince pie, glass of milk and a carrot for the reindeer. Like last year, I've also included a magic key to make it more believable - as we don't have a chimney and I'm sure when Sophie is older she will ask how he will get in! I've included this festive Buddy & Bear plate and this cute Santa tumbler, which has a straw. Finally, I've included The Night Before Christmas book which we will read at bedtime, The Snowman and the Snowdog DVD which Sophie absolutely loved last year and a new pair of festive socks. I hope you enjoyed taking a look at Sophie's Christmas Eve Basket! You can see ones from previous years here and here. Are you putting together a Christmas Eve Basket this year? Soooo cute! I love all the things you have popped in the basket.